As development and gentrification drive up rents, Aikido Center of Los Angeles may soon be forced to seek a new home. Chief instructor David Ito demonstrates proper throwing techniques. Driving through almost any section of the endless sprawl that is Southern California, you will undoubtedly see signs (some hand-written) for martial arts studios in strip malls and distressed-looking buildings. Lessons for karate, kung fu and tae kwon do are as accessible as 7-11s and McDonald’s. A few of the studios may be pulling from the same fast-food labor pool. There was a time when the martial arts like judo, karate and kendo were almost exclusively taught by Japanese for Nikkei. But as with so many other cultural arts and activities gone mainstream, anyone today can read a book, buy a gi and claim to be an instructor. To be fair, many of these studios are run by dedicated individuals who have studied under a proper teacher. But in America, the authentic can be pushed aside by an enterprise that is cheaper and less demanding of its students, who may just want to learn how to break a wooden board with their fists. “Everybody wants it instantly,” observed David Ito, chief instructor of the Aikido Center of Los Angeles. In a nondescript warehouse on the corner of Elmyra and Main streets, the venerable Aikido Center operates its modest dojo under the radar. Easily lost amidst the restaurant supply outlets, warehouses and industrial operations, the dojo blends into the local scenery. The front entrance is always closed, so everyone enters from the side or the back of the building. Inside, a high-ceilinged open room unfolds with mats covering the majority of the floor. In one corner, there are sliding doors in front of small alcoves and on the other, a full-length mirror that makes it appear as if there is another room. A number of tansu or Japanese cabinets ring the perimeter, framed calligraphy hang on the walls and a scroll centers the tokonoma (alcove) that one would expect to find in a Japanese home. Ito slides open doors to an alcove to reveal his sensei’s old gi, a statue featuring a Buddhist sword and shelves and shelves of books. Almost everything here belonged to the late Rev. Kensho Furuya, founder of the Aikido Center of Los Angeles. “He used to live at the dojo,” Ito explained. This dojo represents the vision of Rev. Furuya. Inspired by his maternal grandfather, young Daniel Furuya earned his shodan (first-degree black belt) in kendo at the age of 10 and in aikido at age 14. He also studied iaido (a swordsmanship martial arts that emphasizes spiritual preparedness), but focused on aikido under Mitsunari Kanai while he was an undergraduate at Harvard. In 1969, Furuya became a live-in student at the Aikido World Headquarters in Japan. Morihei Ueshiba, the founder of aikido, had just passed. Known as O’Sensei, Ueshiba disagreed philosophically with other budo or martial arts, since most train to kill or main to defeat an opponent. Aikido is a martial art, but technically it relies on redirecting an opponent’s force and aggression with the goal of doing as little harm as possible. Furuya studied under Kisshomaru Ueshiba, O’Sensei’s son. Returning to America, Furuya Sensei began teaching aikido in 1974. In 1984, Furuya Sensei opened the Aikido Center of Los Angeles amongst the warehouses east of Alameda in what is now known at the Arts District. Thanks to Furuya Sensei, the dojo is one of the few with direct affiliation status with the Aikikai Foundation-Aikido World Headquarters in Japan. He became one of the foremost proponents of aikido in the United States, producing a nine-volume video series,“Aikido Shoshinshu: The Art of Aikido.” He also studied under Bishop Kenko Yamashita and, in 1989, was ordained a Zen priest of the Soto Zen Buddhism, Zenshuji Temple, where he was given the name of Kensho. Sadly, much of what Rev. Furuya had envisioned was thrown up in the air in 2007. First, the owner of the building where the Aikido Center was headquartered directed the dojo to move out. The owner wanted to open his property for the ongoing gentrification of the neighborhood. In exchange for leaving, the owner did offer the space where the dojo is located today. 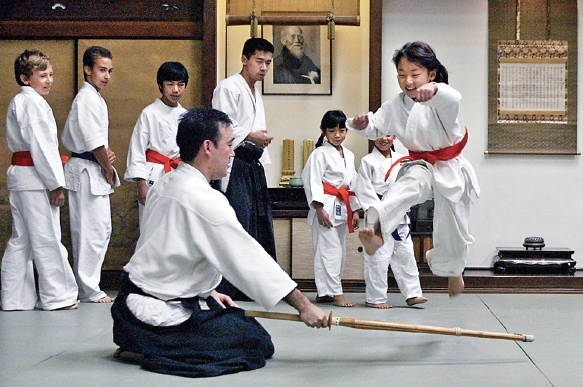 But it was a blow to the Aikido Center to move much farther away from Little Tokyo. Young dojo members enjoy a drill led by Ken Watanabe, holding the baton. Second, in the midst of the forced removal, Rev. Furuya unexpectedly collapsed and died from a heart attack at the dojo. Ito, who was present, recalled that Sensei was joking with his students at the time, so David initially thought Rev. Furuya was being playful when he fell. Ito administered CPR, but his teacher did not survive. Ken Watanabe (Rev. Furuya’s student for 18 years and senior most instructor who serves as chief instructor of iaido), Ito and the other long-time students were determined to maintain the Aikido Center in honor of its founder. Since Rev. Furuya was a bachelor without direct heirs, the group organized the Furuya Foundation to take possession of all of the property in the dojo. Watanabe is the president and Ito is the executive director of the foundation that runs the dojo. They signed a 10-year lease on the current space with a five-year tenant option and did their best to recreate the original dojo. Also, the instructors and members all have jobs and family lives to manage. Ito works as an acupuncturist and lives in Thousand Oaks. Watanabe is employed at a gymnasium in Pasadena. Yet the dojo is open every morning and evening. According to Ito, there are about 50 members of the dojo who come from as far away as Westlake and Orange County. 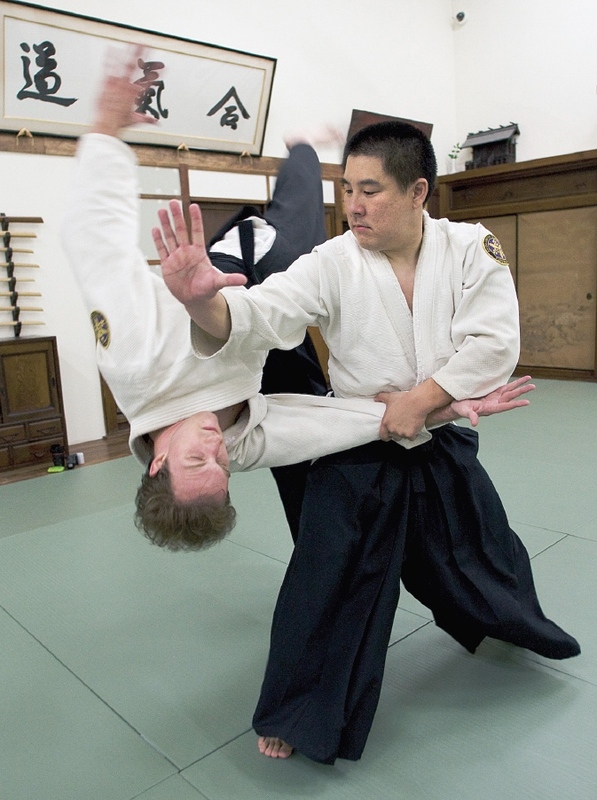 Following Japanese traditional culture, the Aikido Center is making the best of its situation. But as in 2007, the neighborhood is changing around the dojo again. The open space a block away, once known as the Cornfield, was turned into a state park. The Metro light rail Gold Line opened a Chinatown station nearby. Lately, micro-breweries and high-end restaurants like Major Domo have taken over the nearby industrial sites. Watanabe checks for Maria Murakawa’s correct stance and posture. As with the Arts District, gentrification has insinuated itself into the neighborhood and nothing can stop it. The owner of the building sub-leased it to another business, which has steadily raised the monthly rent on the dojo. With a brewery opening next door to the dojo, Ito feels change is coming fast. 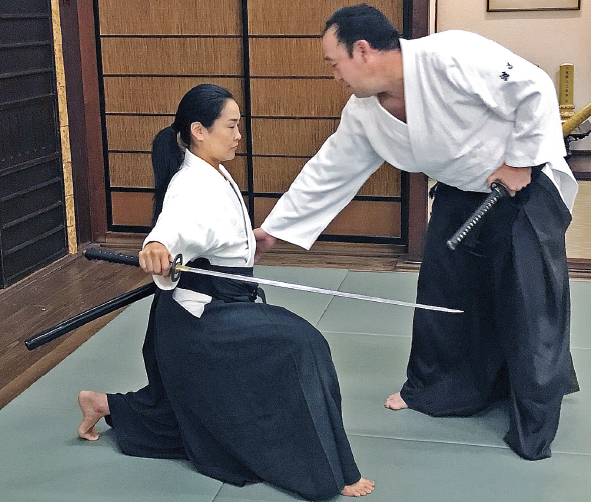 While moving into Little Tokyo or the Arts District is not financially feasible, the Aikido Center is hoping to find a space just south of Third Street. That area is the beginning of historic Skid Row, but the dojo needs to find an affordable space. With a small membership base, the Aikido Center has limited resources. “There are no grants from most foundations to support a martial arts dojo,” said Ito, who obviously has done the research. The Furuya Foundation is hoping that the Little Tokyo Service Center might be able to identify some opportunities for a new location. It is also seeking financial support from the greater community, in part because of what the Aikido Center represents to Japanese Americans. The members of the Aikido Center of Los Angeles embody that ideal and continue to honor their sensei. 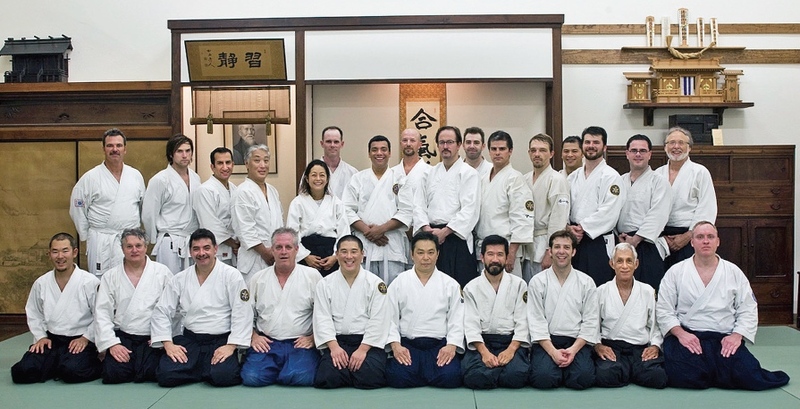 The Rafu Shimpo Foundation has previously donated to the dojo and is making a donation in 2019 to mark the group’s 45th anniversary since its founding. Moving as close to Little Tokyo as possible is an important goal for the dojo and any support it could get at this crucial time would be timely and maybe even a little Zen. Rev. Furuya would approve. More information on the Aikido Center of Los Angeles can be found on its extensive website at www.aikidocenterla.com.